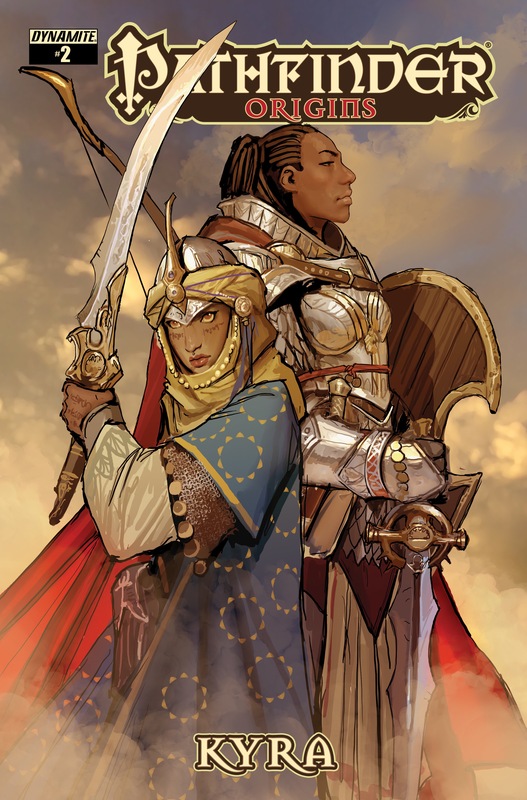 To prove herself to the legendary Pathfinder Society, the holy warrior Kyra recounts a tale of heroism from her youth in the distant land of Qadira. When a village of desert ratfolk is massacred, only Kyra and the paladin Seelah are willing to take up their cause and hunt down the bloodsucking monstrosities responsible. From Pathfinder co-creator James L. Sutter (Pathfinder: Goblins, Death's Heretic) and artist Kevin Stokes (Pathfinder: Goblins, Secret Origins) comes an adventure of blood, sand, and redemption. Contains a pull-out poster map and official Pathfinder RPG bonus encounter! It's probably not terribly important, but this cover appears to be incorrectly priced. Wow never realized how tall Seelah is supposed to be. Yeah, my only complaint about this is that it isn't the paizo.com exclusive cover - cause I'm not getting two copies.